Ayatollah Khomeini, the first Supreme Leader of the Islamic Republic of Iran, upended the regional balance of power with his revolutionary movement. How did he accomplish it and what were his motivations? The man we know as Khomeini was born under the name Ruhollah Mousavi on September 24, 1902 in the small village of Khomein, Iran. Born into a family of religious scholars, his name appropriately meant “spirit of God”. Much later in life, he would change his name to Khomeini, that of his hometown. Shortly after his birth, Khomeini’s father was murdered, and he was subsequently raised by his mother and aunt, who both died when he was 16 years old. In 1920, Khomeini was sent to Arak, by one of his two Shi’i Ayatollah brothers. There, he furthered his Islamic studies under the Islamic scholar named Hazdi Ha’iri. Khomeini followed Ha’iri a few years later to the city of Qom. Following the death of Ha’iri, Ayatollah Boroujerdi became his teacher, until his death in 1961. At that point in time, Khomeini had begun teaching as a way of sharing his frustration that Islamic roots and values had been lost within the secular government of Iran. Upon the death of Boroujerdi, Khomeini took over as religious leader, which gave him the opportunity to reach a larger audience. In contrast to the style of his two teachers, who believed that religion should not be intertwined with government, Khomeini publicly expressed his objection to the modernizing of Iran and its distancing from Islamic principles. For that, he was arrested and sent into exile in 1963, first to Turkey, but later to Iraq. During the 15 years that he spent in the religious centre of Najaf, Iraq, Khomeini sermonized against the Iranian regime and became the primary spokesperson and mentor within and beyond the organized Islamic Coalition of Mourning Groups (later to be called the Society of Islamic Coalition), which participated in the uprisings of 1963, the assassination of prime minister Hasan-Ali Mansur in 1965, and ultimately the Islamic Revolution of 1977-79. The “Governance of the Jurist “ speech and publication played an instrumental role in the acts of the coalition. Because of the close relations the Shah had with the governments of the West, particularly the United States and the United Kingdom, religious leaders like Ruhollah Khomeini gained popularity among a large portion of the population. Before his eventual deposition during the Iranian Revolution in 1979, the Shah of Iran was a secular autocrat who had a vision of his country that was very different than that of the clergy. As part of his policies aimed at westernizing his society, Mohammed Reza Shah kept a tight hold on many aspects of his country. The SAVAK, his secret police and intelligence agency, had close ties to the CIA and Mossad, ultimately fueling revolutionary fervor among the Muslim population. The agency was formed with American help following a joint CIA-MI6- orchestrated coup, which removed the democratically elected Prime Minister Mohammed Mosaddegh from power after he nationalized British and American oil interests. The SAVAK was known for its brutal torture and execution of political dissidents, as well as media censorship and surveillance of Iranian citizenry. Khomeini had a complicated relationship with the SAVAK; then-director of SAVAK, Hassan Pakravan, used to enjoy dinner with Khomeini each week while the latter was under house arrest. Also, before the Shah’s government eventually decided on exile, Pakravan’s advice not to execute the Ayatollah was well received. After denouncing the Shah in 1964, Ayatollah Khomeini began his 15-year-long exile. In 1970, the sixth year of his exile from Iran, Khomeini gave a series of lectures in Najaf, Iraq, which were compiled into Islamic Government: Governance of the Jurist. The work outlines the necessity for an Islamic government in place of the Shah of Iran. Khomeini explains, through his vast experience in Islamic jurisprudence, the legal basis both for forming an Islamic government, and the responsibility of other mujtahid to obey a government based in Sharia. His belief was that during the time of the Occultation of the Twelfth Imam, the right to rule went from the Imams to the mujtahids. In the face of westernization, secularization, and the relegation of the clergy, Khomeini argued that the necessity for a change in government was obvious to good Muslims, and that any mujtahid, and by extension the muqallid, would be required to support a government whose laws were based with Islamic values at their core. Khomeini outlines three fundamental ideas; firstly, he discusses the necessity for governance by Islamic laws. He argues that the Qur’an lays out a set of laws for all aspects of life, and that government should reflect the laws of God. He cites the government of the caliphate set up by the Prophet, and uses it as an example of the responsibilities of government, in contrast with the contemporary secular autocratic government of Iran. He cites both the Qur’an and the Hadith to identify the responsibilities of a successful Islamic state, including the fiscal and military responsibilities of the state. Khomeini enforces his ideas using the existence of Zakat and Jizyah as proof of the necessity of an Islamic government, and he outlines the way in which the government is to act in relation to society. He compares both the Umayyads and the Shah to the emperors of Rome and the Pharoahs of Egypt, noting that governments such as these must not be allowed to continue to rule in their non-Islamic or anti-Islamic styles. As an example of how the removal of Islamic influence is destroying society, Khomeini compares the judicial system of Shari’ah to that of the one operating with foreign laws. He states that the prevailing system under the Shah’s imperialistic government tends to drag on forever, be misused, and be a prolonged interruption of a person’s daily duties and way of life. His argument for Shari’ah law is based on regarding people’s time and way of life as being important, and that it avoids the possibility of unjust decisions resulting from bribery. He also purports that the penalty executed by Shari’ah is proportionate to the crime, and is not tied to specific campaigns against corruption as within Western governments. Khomeini’s argument claims that the penal provisions of Islam allow for the swift, just and simple adjudication of cases via Shari’ah courts, and is more effective in preventing repetition of disallowed behavior. In his speeches, Khomeini gives specific instructions to his listeners, mapping out what is necessary to successfully communicate the beneficial effects of Islam on society. He encourages scholars to write and publish books, and to improve their methods of reaching and convincing the Iranian people through preaching and other activities. Khomeini says to them, “Know that it is your duty to establish an Islamic government.” He is motivating and empowering them towards the goal. In his program for the establishment of an Islamic government, Khomeini identifies two fundamental activities that must be undertaken, those being propagation and instruction. In order for a movement to have thrust, it would be necessary to multiply the numbers of like-minded people, to have strength in numbers. Mobilizing the masses by helping them recognize the oppressiveness of the current government, and convincing them of the validity and benefits of an Islamic government would be primary. It would require shedding a more positive light on life under Islamic rule, and dispelling any doubts about the religion that may have been input in their minds by the imperialistic government. Just as important to Khomeini, however, was the generation of an intellectual awakening that would be well educated in the creed, ordinances, and institutions of Islam. His two-pronged approach is meant to encourage the people to destroy the foreign tyrannical government, then to enter the symbolic doors of Islam towards a social system under the laws of Islam. By looking at the historical period in which Khomeini developed the ideas in Governance of the Jurist, one can more easily understand his concerns. The formation of Israel in 1948 and the subsequent regional tensions deeply impacted the entire Islamic world. Although Iran enjoyed good relations with the United States and Israel, its religious base, which included Khomeini, was aligned closer with the Arab states in their opposition to Israel’s existence in what they saw as the Muslim land of Palestine. Khomeini’s contempt for Israel and the Jews in general is demonstrated in various sections of the text. For example, he used the existence of Israel as evidence of the necessity for an Islamic state in Iran. Citing the Qur’an’s command to Muslims to be ready to protect their land, he blamed the non-Islamic governments in Muslim lands for the emergence of the Jewish state and the subsequent expulsion of Palestinians. Not only does he count the Jewish state as an enemy of Islam, he also counts its supporters as enemies of Islam. The United States and its close relations with Israel only added to the contempt Khomeini had for American foreign policy. Khomeini’s beliefs were only strengthened with time, as he would later refer to Israel and the United States as the little Satan and Great Satan respectively. In order to gain domestic support and propulsion towards the implementation of an Islamic government, Khomeini’s speeches and subsequent publications, including “The Governance of the Jurist”, were smuggled into Iran and shared with local Islamic scholars. His writings on Islamic science and doctrines, led many Shi’i Iranians to regard Khomeini as a person to be emulated. Khomeini utilized his speeches to evoke radicalization and to encourage Iranian Islamic scholars to spread the word amongst the Iranian people in order to create more opposition to the imperialistic government that was then in power. It was with these speeches and publications that he was able to be an effective motivator behind the scenes, to instill fury amongst people who were starting to doubt the benefits of the secular government operated under the Shah. In essence, “The Governance of the Jurist” was a manifesto, used to prove to the religious leadership and the rest of the population the necessity, form, and method for the establishment of an Islamic government in Iran. Such a government would be defined by the law of the Divine over men. 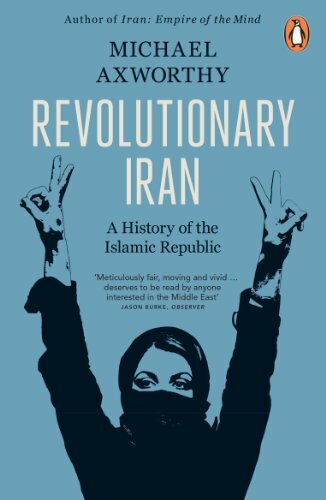 Today's book recommendation is Michael Axworthy's Revolutionary Iran.